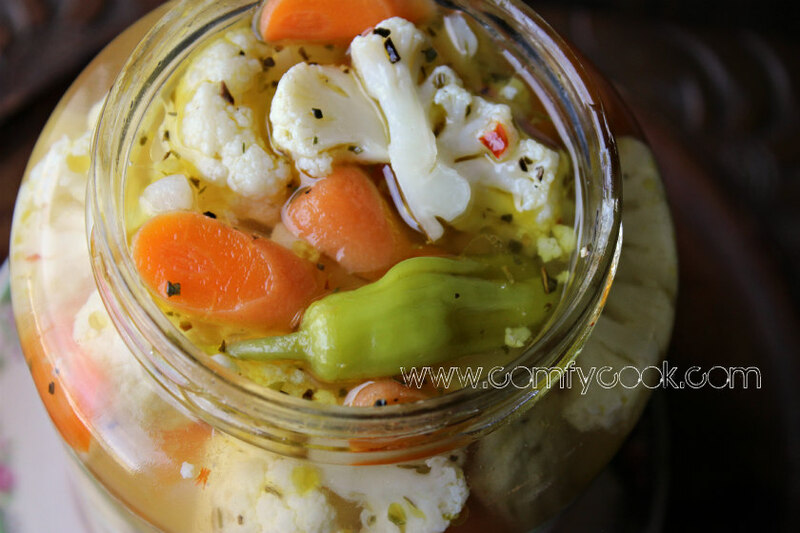 We love Giardiniera - but the cauliflower is our favorite part. 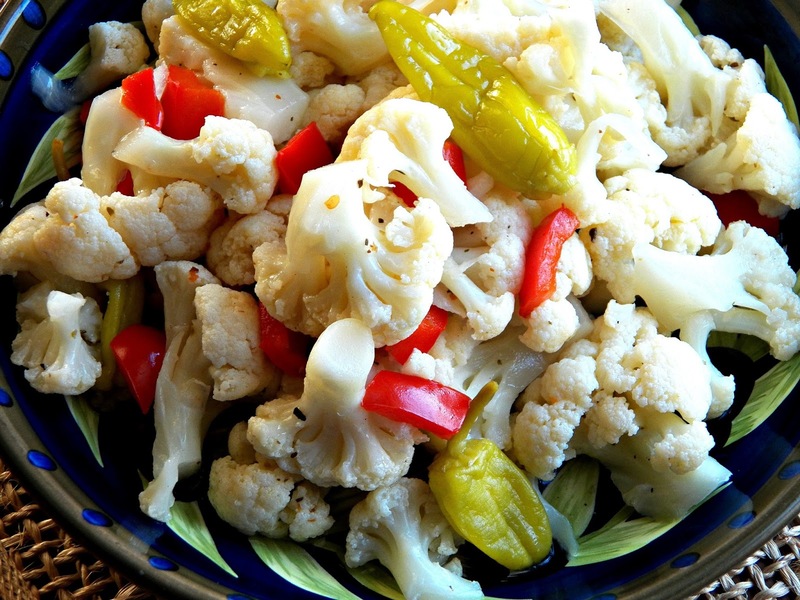 This is a quick pickled, spicy salad chocked full of cauliflower. Add any additional veggies! Sliced carrots or celery - any veggie that will hold up well for pickling. 2 cups white vinegar 2 cups water 2 Tbsp. sugar 1 bay leaf 1/2 tsp. crushed red pepper flakes (more if you like) 1 tsp. salt 1 large head cauliflower, trimmed and cut into bite-size florets 1 red bell pepper, cut into 1-inch pieces Pickled pepperocini peppers 1/2 tsp. oregano 3 Tbsp. extra-virgin olive oil Freshly ground black pepper Combine vinegar, water, sugar, bay leaf and crushed red pepper and salt in a large saucepan Bring to a boil. Add cauliflower and bell pepper. 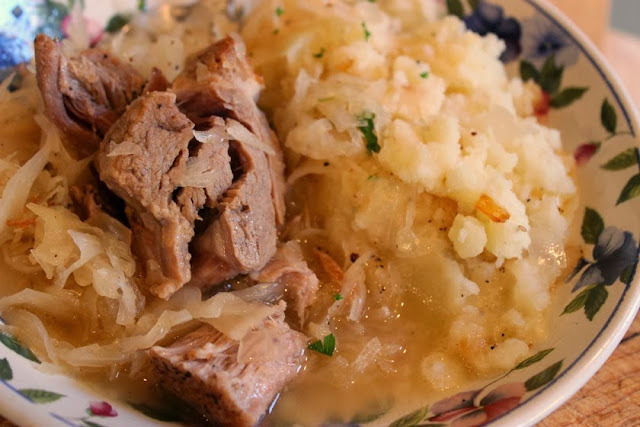 Maintain a lively boil and cook until the vegetables are tender-crisp, about 5 minutes. 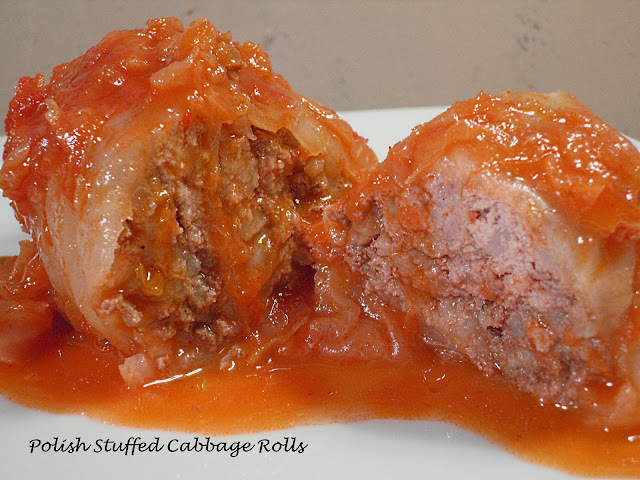 Remove from heat and let stand for 5 minutes. Reserve cooking liquid. Transfer the veggies to a medium bowl, Stir in oil, oregano, pepperocini and salt and pepper to taste. Add reserved cooking liquid. Pack into jars and refrigerate. I save jars. Since I usually make small batches, these jars are the perfect size for pickles and this Italian Salad. I use a lot of Giardiniera. Never thought about making my own. Cool!